Upheaval Dome is the site a meteor hit 200 million years ago. This backpacking trip has several options and is for experienced backcountry adventurers. Hike to the mouth of Upheaval Dome, 3.6 miles from the trailhead and camp. From there there is a 4-mile round trip hike to explore the inside of the Dome or 7.4-mile round trip hike to the Green River. It is 1.7 miles to the dome viewpoints. Entrance to the park is $10 for a vehicle and is valid for 7 days, Motorcycles are $5 each and entrance is valid for 7 days. Per person with no vehicle (bicycle) or parties of one are $5 and is valid for 7 days. There is also an annual parks pass available for $25 that gives a years entrance to all National Parks. Check the Park’s website as some days of the year such as Martin Luther King Jr. Day and Veteran’s Day are free. Upheaval Dome is one of the more unique sites in the Moab area. Resulting from a meteor strike and the effects of a bounce-back off the earth’s crust this area has endured time and erosion -- this dome is worth exploring. Backpacking to the opening and hiking into the dome, down to the Green River will be a memorable experience. It is a backcountry experience. The trail in heading twill descend rapidly on a trail of epic engineering and follow a wash to a junction. At the well-signed junction go left to the Green River or right to the entrance of Upheaval Dome. There is camping at the Green River (it is reserved for 4x4’s but may be available) and at the entrance to the Dome. Inside the Dome is fascinating. Everything is upended dramatically and there is salt everywhere. 200 million years ago a meteor hit the earth’s crust with such impact it vaporized immediately creating a crater. Rock layers rebounded inwards and upwards to fill the void. Erosion removed the top layers and exposed the tilted broken core of the impact site. This all mixed with the thousands of feet of salt left by the inland sea that covered this area 300 million years ago caused a reaction of sediment pushing down on the softer salt layers pushing the dome upwards and salt rising and fracturing the rock layers while water eroded the salt and sediment it exposed the distorted crater. This area is rough, raw and unforgiving. 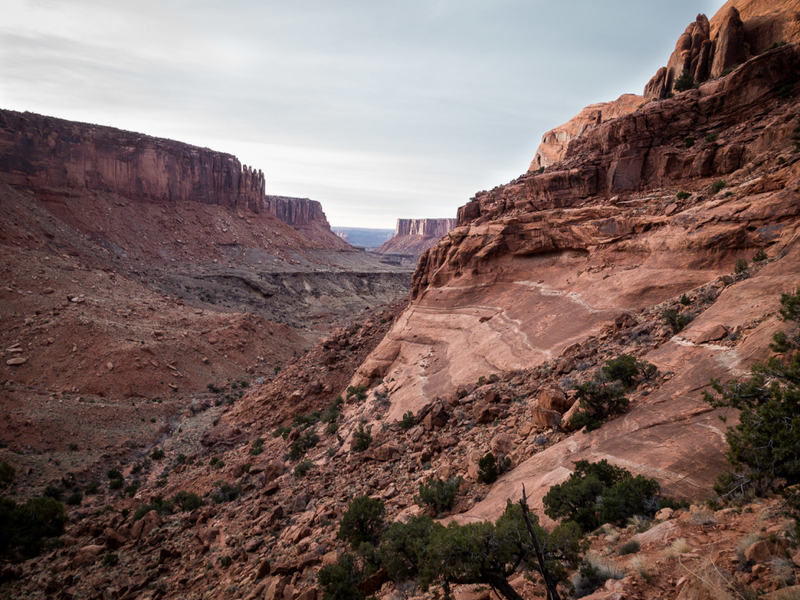 Adventurers who head into it should be experienced, strong and currently in shape to be able to descend and ascend the 1480 feet from the parking lot to the lowest point of the trail at the junction of Syncline loop and the route through Upheaval Canyon to the Green River. This will be a challenging trip out to anticipate before committing to it. Plan to carry all of your water, and bring extra. There is no water available at the trailhead. From Moab, drive north on route 191 for about 10 miles, take a left on route 313 following the signs for Canyonlands National Park and Dead Horse Point State Park. Follow the signs into Canyonlands stopping at the gate to pay fee. In the winter and shoulder seasons, payment may be made at the Visitors Center further up the road. 6.5 miles from the Visitors Center, take a right following the signs for Upheaval Dome, the trailhead and parking are 5 miles from this turnoff. Entrance to the park is $10 for a vehicle and is valid for 7 days, Motorcycles are $5 each and entrance is valid for 7 days. Per person with no vehicle (bicycle) or parties of one are $5 and is valid for 7 days. There is also an annual parks pass available for $25 that gives a years entrance to all National Parks. Check the Canyonlands National Park’s website as some days of the year (such as Martin Luther King Jr. Day and Veteran’s Day) are free. No dogs are allowed on this trail. Do not leave dog in car while hiking.